Shoulder bursitis describes the inflammation of the bursa which can get pinched when lifting the arm. A bursa is a fluid filled sack whose job is to prevent friction between surfaces and help muscle tendons run smoothly over bony surfaces. If there is an issue with the strength/ function of these tendons or muscle dysfunctions that cause the subacromial space to reduce then the bursa can become inflamed (bursitis). There can also be an underlying tendinopathy or tear in one of the four rotator cuff muscles that causes this dysfunctional movement. The Rotator Cuff – comprises of 4 individual muscles (supraspinatus, infraspinatus, teres minor and subscapularis) that closely work in synergy to keep the humeral head (upper arm bone) centred within it’s socket. If one or more of these muscles is weak or injured then this can result in lack of motor control of the arm and overtime cause bursitis. Who is at risk of developing shoulder bursitis? 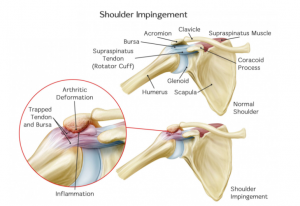 Shoulder bursitis can affect all ages but is most common between the ages of 40-60. Bursitis can have quite a sudden onset during sports (overhead sports), weight training or even during daily activities such as reaching overhead to a cupboard. But more commonly has a gradual onset over weeks or months. How to fix your shoulder pain? A skilled Physiotherapist can assess your shoulder posture, movement, strength and function to diagnose your shoulder issue through evidence based tests. If required, your Physio can also refer for further investigations such as an Ultrasound to confirm the diagnosis. Restore full active movement by eliminating the causes of impingement. Guide you through a specific strengthening program to return to full activity/ sport and reduce the likelihood of further episodes. The best cure will always be prevention and by getting strong, healthy shoulders you can help limit the likelihood of developing bursitis. Once again a visit to your physiotherapist can develop the right strengthening program for you. The Physiotherapists at Northwest Physiotherapy are highly skilled clinicians who have vast experience in assessing and guiding patients through recovery from shoulder pain. Click here to find your nearest practice.